Jeffrey Magee had a rough start to life, losing his parents and falling into the hands of dysfunctional, loveless relatives, but it was when he ran away to live on his own that his story really begins. An obsessive runner, Jeffrey’s feats of daring and speed snowball, and his fame grows among the neighbourhood kids, who dub him “Maniac” Magee. Through all his misfortunes, his heart remains free of ill-will and prejudice. He is the only person who passes freely from the white West End of Two Mills to the black East End and back again at a time when the two populations just do not mix. His fearlessness and good humour wins admirers everywhere he goes, and his unique position bridging two worlds helps draw everyone a little closer together. This is an entertaining look at urban legends and the truth behind the tall tales. Maniac’s exploits are at once heroic, unbelievable and utterly believable. He finds a loving home with a black family, then runs away when neighbours make things difficult for them. He meets a lonely old caretaker at the zoo, and creates a new family with him until the old man dies. Then Maniac falls in with two hero-worshipping brothers and their dangerously violent older brother and father, who have turned their ramshackle apartment into an anti-black military bunker. Maniac runs a fine line between the city’s black and white worlds, and only his pure heart and sheer velocity can keep him safely on his feet. 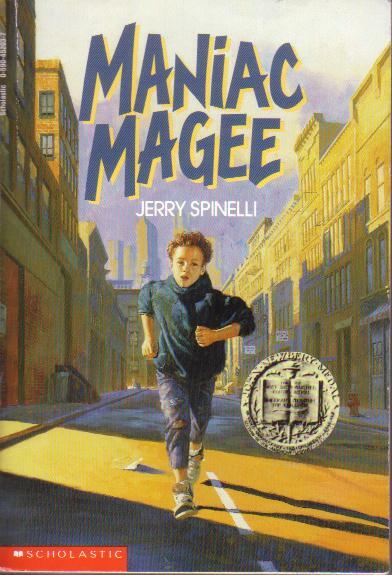 Readers will find Maniac Magee admirable and captivating, and the effect he has on others is fascinating. While Maniac is naive about the world, always seeing the best in people, his good deeds do have a dramatic, positive effect on everyone he meets. The violence of the two neighbourhoods is convincing depicted, and this book paints a vivid picture of the racist fringes which, sadly, still persist in America twenty-five years after this book was written. (NB. The threat of violence is at times disturbing, particularly when he visits the brothers in their bunker-apartment.) This book also effectively portrays the lives of the homeless, and the small ways they find dignity and carve out their own space in the world. A fast-paced, funny, touching story about homelessness, racism, makeshift families, courage, loyalty, and running. Here’s another helpful review of this book from the good folks at Commonsense Media.